Hakan Sukur was chosen the most outstanding player of the past 50 years for UEFA's Jubilee awards. "Hakan Sukur (a prominent Turkish soccer player in Galatasaray) has enjoyed unprecedented success in domestic and international competitions and become Turkey's most recognisable player," stated UEFA under a news titled "Hakan Sukur still towering in Turkey" in its web-site. "It is no accident that the rise of Turkish football in the early 1990s coincided with the emergence of the country's newest football star. Hakan Sukur has amply fulfilled that early promise, enjoying unprecedented success in domestic and international football and becoming Turkey's most recognisable player," UEFA noted. "His country's top scorer in international football, Hakan Sukur holds Turkey's record for the most goals in European club competitions with 38 strikes, and has been a prolific scorer in the Turkish league," UEFA stated. Portsmouth's Sol Campbell(R) tackles Middlesbrough's Tuncay Sanli during their Premiership match at Fratton Parkin Portsmouth. Sanli's goal was good enough to give Middlesbrough a 1-0 win away to Portsmouth as the home side failed to score at Fratton Park for the sixth straight Premier League match. Portsmouth’s amazing home drought continued as Turkish striker Tuncay Sanli pounced on a David James fumble to hand Middlesbrough three points at Fratton Park. It was Pompey’s sixth consecutive scoreless home outing in the Premier League and the cheers from Wednesday’s goalless draw with Arsenal soon faded away in a shot-shy display. Papa Bouba Diop was outstanding for Pompey, running the show from midfield and filling the holes left by the injured Sean Davis, flu-victim Pedro Mendes and surprisingly-dropped Sulley Muntari. But the Senegal international could not convert his dominance into goals and, after Tuncay had struck for his fourth goal in six games in the 20th minute, he fired over a golden chance to equalise just before half-time. Diop’s enormous figure was seemingly everywhere as he tried to rouse Pompey but the home fans probably wished it was anyone but him on the end of Benjani’s cutback in first-half stoppage time. Diop has yet to score since his £3m move from Fulham in August. Tuncay, however, was the first to show some purpose in a scruffy start to a frenetic encounter, shooting wide on the turn with James confidently looking on. John Utaka’s mazy run on the right eventually took him into the Boro area and, although he was challenged as he attempted to shoot, the ball ran loose for Niko Kranjcar to fire a low drive which Mark Schwarzer smartly held. Sol Campbell had to time his tackle just right to deny Tuncay when Boro broke back and from the resultant corner Kanu was back defending, at the expense of another flag kick. Neither side showed much creativity in the opening 20 minutes. Kranjcar had a goalbound free-kick blocked by an efficient Boro wall after Mohamed Shawky manhandled Kanu off the ball and Stewart Downing’s set-piece was also blocked after a clumsy foul by Diop on Tuncay. But then Boro gratefully collected a soft goal and a surprise lead as Pompey dithered at the back. 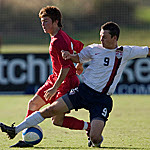 Tuncay started the move, seizing on the loose ball after Campbell and Lee Dong-Gook contested Luke Young’s long punt forward. He switched it right, from where Stewart Downing’s cross sailed beyond the far post and O’Neil volleyed what looked like a shot of little power. James should have dealt with it but fumbled and Tuncay – despite looking suspiciously offside - followed up to knock into an empty net. Tuncay wore an almost embarrassed smile as he ran to celebrate with former Pompey hero O’Neil, who had recovered from a hamstring injury to come in as one of four changes in the Boro line-up. Strike partner Lee would have added another soon afterwards but for Hermann Hreidarsson’s intervention but Pompey’s reprisals were all stoutly resisted, even though battling Boro picked up four bookings in the second half when they pulled everybody back behind the ball. The introduction of substitutes Matt Taylor and David Nugent gave Pompey an edge at last but when Richard Hughes made a rare attacking move from midfield and knocked down Taylor’s free-kick in the 65th minute, Kanu shot against the post from six yards. Pompey seemed destined not to score after that. Defeat was their first by Boro since 1994 and they have now gone 540 minutes without scoring at home. Vestel Manisaspor got they wanted and let go under stress Filip Holosko!.. After what he said and did to his coach Giray Bulak in the last match of the first half against his new team Besiktas, he really put a question marked on my mine about his character. I wonder how he is going to treat a young coach Ertugrul Saglam when he gets there?!.. Vestel Manisspor will get five million Euro and two other players on loan. Those players are Koray and Burak. The deal will seal this weekend according to Turkish media. Fenerbahce's soccer team coach Brazilian Zico kicks the ball during a friendly soccer game called the Game of the Stars, in Rio de Janeiro, Thursday, Dec. 27, 2007. Fenerbahce coach Zico returned to his native country this week to organize a charity football match between his former club Flamengo and a team assembled from stars from around the world. The famous Maracana stadium in Rio de Janeiro played host to the end of year fundraising football(soccer) match. Player-organized fixtures like these are becoming a familiar feature with Brazilian crowds these days, but this one was different - the star of the show was a returning hero who still holds the record for goals scored at the 57-year-old ground. Arthur Antunes Coimbra - better known the world over as Zico - called in a few favors and set up a match between the 1987 Flamengo team and a side made up from rest of the world - the 'Friends of Zico'. During a 12-year career with Flamengo, Zico was a key player in a golden era. He led the team to victory in both the 1981 Copa Libertadores and the 1981 Intercontinental Cup, and four national titles came his way either side of a two-year spell in Italy. Now 54 and coach of Turkish champions Fenerbahce, Zico turned out in the colors of his former club, with current stars such as former Inter Milan striker Adriano, FC Barcelona midfielder Deco and Japanese international Hidetoshi Nakata on show for the Friends. Flamengo 1987, a side made up of players from one of the club's most successful eras, beat a 'Friends of Zico' XI by eight goals to five, but the real winners were a series of charitable institutions, which received the gate receipts from a crowd of more than 35-thousand. The Fenerbahce coach who scored twice for Flamengo was all smiles and thanked everybody for making this match possible. Newcastle midfielder Joey Barton is tonight in police custody in connection with an allegation of assault. The 25-year-old was one of three people arrested in Liverpool in the early hours of today. According to reports in tomorrow's Daily Mail, a complaint was made by two men who said they had been attacked by Barton and his companions. The footballer, who grew up in Huyton, Merseyside, signed for Newcastle from Manchester City this summer in a £5.8 million deal. Every one thought, he was going to be a star in the European Football(soccer).. He was young and he made a name for him self in Vestel Manisaspor, Turkish team. But, His coach Giray Bulak, gave him a different duty in the beginning of the second half....... after a couple of mistakes and not paying attation to his duty ,his coach Giray Bulak, substituted Holosko in the 57th minute of the match. As he was coming off the field he said F.....You to his coach Giray Bulak than he kicked the pole near the bench. Former UEFA Cup winners Galatasaray and Bayer Leverkusen will meet in the first knockout round of the UEFA Cup with a possible clash with Hamburg SV awaiting the winners. Leverkusen, who lifted the trophy 20 seasons ago, start as favourites to advance after winning their UEFA Cup qualifying group. 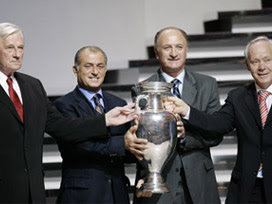 Galatasaray, the first and only Turkish club to win a European trophy when they won the UEFA Cup in 2000, qualified from their group despite winning only one of their four matches. If Leverkusen come through they could face German rivals Hamburg, who qualified as UEFA group stage winners. Hamburg beat Leverkusen 1-0 in the Bundesliga in August and there is a big German presence in the competition with the top four teams in the Bundesliga still involved. Leaders Bayern Munich will play Aberdeen in the first knockout round while Werder Bremen, runners-up in this competition last season and lying second to Bayern on goal difference in the Bundesliga, face Braga of Portugal. The draws for the first and second rounds of the competition were made at UEFA headquarters in Nyon on Friday with some intriguing ties in prospect. Former winners Tottenham Hotspur, the first club to lift the UEFA Cup in 1972 and triumphant again in 1984, and PSV Eindhoven, the 1978 winners, could also face each other in the round of 16 if they both come through their first round ties. Spurs will play Slavia Prague, who were beaten 7-0 by Arsenal when they visited London for a Champions League Group H match in October. PSV, who, like Slavia, dropped down from the Champions League, face Helsingborg of Sweden in the round of 32 and will meet the winners of the Spurs-Slavia tie if they qualify. With this year's final scheduled for the City of Manchester Stadium on May 14, English clubs will be even more focused than usual on reaching it. Bolton Wanderers though will have to negotiate their way past Atletico Madrid and then either Sporting Lisbon or Basel if they are to reach the later stages. Everton, who won all four of their group matches to qualify for the last 32, face Brann Bergen of Norway in the first knockout round, then either Rosenborg Trondheim or Fiorentina. A rare all-Norwegian European tie is also possible if Brann and Rosenborg qualify. The draw for the first knockout round of the Champions League has been made by Uefa in Nyon in Switzerland. And most British clubs face a tough round, though Chelsea who will be pleased with their draw against Olympiakos. Arsenal v AC Milan, Olympiakos v Chelsea, Liverpool v Inter Milan, Olympique Lyon v Manchester United, Celtic v Barcelona, Schalke 04 v Porto, AS Roma v Real Madrid, Fenerbahce v Sevilla. GALATASARAY GETS HELP FROM BORDEAUX!.. Galatasaray only drawing at home to Austria Vienna, a point at home to Bordeaux would have been enough for Panionios to progress to the knockout round. But, after taking a two-goal lead, Panionios crumbled and allowed Bordeaux back into the game before the French side scored a late winner. Panionios were in front after six minutes when Rafik Djebbour converted from the penalty spot after being fouled by Ecuele Manga. Grigoris Makos made it 2-0 on 20 minutes when crashing a magnificent volley into the top corner from 25 yards. Bordeaux pulled one back before half-time when Fernando Cavenaghi fired home from the edge of the penalty area. Another fine Cavenaghi finish on 75 minutes levelled the scores before Wielfried Moimbe poached a winner for Bordeaux on 87 minutes. In the group's other game, Sabri Sarioglu hit the crossbar as Galatasaray were held 0-0 at home by bottom-of-the-group Austria Vienna. However, due to Galatasaray's 3-0 win away to Panionios earlier in the group, the Turks were able to pinch third spot. Galatasaray will now meet a group winner, Bordeaux face a third-placed side and Helsingborgs will encounter a team that have dropped out of the UEFA Champions League. At the end of the week 15Th, Sivasspor the Turkey's Turkcell Super League's surprise team was on top of all Istanbul big guns.. This was first time in long time,Anatolian team hold the leagues top place this far in the first half of the Turkcell Super League. Week 16Th was the week that Sivaspor not only got knocked out of the first place ,they end up sharing the second place with Fenerbahce. Galatasaray ,Fenerbahce and Besiktas teams were the big winners in the week 16Th. The gap, in the race for the top spot was closed by Fenerbahce and Besiktas. In the last week of the first half ,before the winter brake, Besiktas, Fenerbahce,Galatasaray and Sivasspor will have difficult matches. Could Galatasaray close the first half, on top of the Turkcell Super League, is for now, question mark in my opinion! A draw or loss in Ankara, could jepordise the first place for Galatasaray. On the other hand Sivasspor will be home against very bad Genclerbirligi and Fenerbahce will be home against Ersun Yanal's Trabzonspor. The team who is chasing these teams very closely, Besiktas, will travel to Manisa to play Vestel Manisaspor. We know, League's rock-bottom teams Kasimpasa and Ankaraspor will have to do miracales in the second half of the season to stay in the Turkcell Super League. Galatasaray claimed a two-goal victory over Sivasspor.Shabani Nonda put the home side ahead with a goal in the 82nd minute, while two minutes later midfielder Baris Ozbek found the net to seal the points at the Ali Sami Yen Stadium. Ankaraspor's relegation woes have increased after they slumped to a 2-1 home defeat to Caykur Rizespor to remain second from bottom. Necati Ates' 57th-minute equaliser looked like it might rescue a point for the home side after Ribeiro Nascimento had given the visitors the lead, but Leandro Rodriguez bagged the winner just three minutes later. The victory moved Rizespor up to 12th in the table, while the hosts have won just twice in 16 games this season. Trabzonspor kept their European hopes alive after coming from behind to record a 2-1 win over Istanbul Buyuksehir BSK thanks to a quick-fire brace from Gokdeniz Karadeniz. Erman Kilic gave the visitors the lead from the penalty spot, but Karadeniz struck twice in the space of four minutes to turn the match on its head. Trabzonspor movedup to sixth with victory, while the visitors are still searching for their first away win of the season. Gaziantepspor upset Konyaspor after goals late in each half from Yunus Ceylan and Ekrem Dag gave them a 2-1 win. Erman Ozgur had levelled for the visitors, who missed out on the chance to move up to fifth. Fenerbahce have moved back to within a point of Galatasaray with a 2-0 win at Genclerbirligi. Burhan Eser had put Genclerbirligi ahead after just 11 minutes, but Semih Senturk equalised in the 66th minute before grabbing the winner five minutes from time to keep Fenerbahce within touch of Galatasaray. Besiktas remain four points off the top after they recovered from their UEFA Champions League exit to beat Ankaragucu 3-1. Goals from Rodrigo Tello and Serdar Ozcan had put Besiktas 2-0 up at the break and although Alper Aydin pulled one back for Ankaragucu just after the restart, Mathias Delgado sealed the win on 67 minutes. Elsewhere, Sandro da Silva saw red for Genclerbirligi OFTAS as they were beaten 2-1 by Denzilispor, Kayerispor saw off Buraspor 4-1 despite having Franco Cangele dismissed late on and bottom-placed Kasimpasa drew 2-2 with Manisaspor. Nihat Kahveci scored two goals as Villarreal snapped a two-game losing streak with a 3-1 win over Getafe. Nihat beat goalkeeper Oscar Ustari with a shot inside the far post after a pass from Robert Pires in the 16th minute. Pires again set up Nihat in the 79th for his second goal at the near post. Santiago Cazorla scored the third for Villarreal in the 84th, two minutes before Kepa Blanco's consolation goal. Villarreal, which had trailed leader Madrid by only one single point before a three-game winless streak, has 31 points. Middlesbrough boss Gareth Southgate :"Tuncay gives us incredible enthusiasm and energy." Middlesbrough boss Gareth Southgate is very happy of the performance of in-form Tuncay . Southgate praised Tuncay and he said : "He gives us incredible enthusiasm and energy "
"He took on an effort that two weeks ago he probably wouldn't have done because of his confidence. "But after scoring two in two coming into this game he has now settled and he has a rapport with the fans who can see the effort he is putting in. "His work ethic has been fantastic since he arrived. It's just that it took him a little while to find the back of the net. "But we are now seeing the quality he has and with three goals in his last three games, they have been crucial for us because all of them have been goals that have won us points." Tuncay Sanli swept home a side-foot volley from 15 yards in meeting a precision first-time cross from left-winger Stewart Downing in the 37th minute to give Boro a second victory in the space of a week. TUNCAY SANLI'S GOAL SEND DERBY TO ROCK-BOTTOM! Tuncay Sanli's great run of form continued as he fired Middlesbrough to a 1-0 win at Derby - in Paul Jewell's first match in charge at Pride Park. 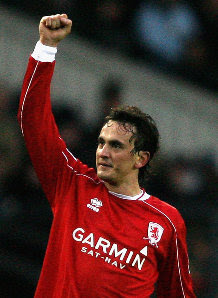 Tuncay Sanli grabbed the only goal of the game shortly before half-time to seal a second successive victory for Boro. The goal came against the run of the play at the time and it was totally out of keeping with what had gone before, as the Rams and Boro had previously appeared Premier League teams in name only. Yet Tuncay's 38th-minute strike oozed quality as he stroked a sidefoot volley beyond Stephen Bywater from 15 yards in meeting a first-time cross from left winger Stewart Downing. The goal stood out like a beacon, and after a run of 11 successive matches without a win for the visitors, it is now two on the trot for boss Gareth Southgate's side to lift them clear of the relegation zone. Yet considering Southgate's side had primarily outplayed Arsenal in a shock 2-1 home win last weekend, this was a performance in stark contrast, in particular until they opened the scoring. It could be that Boro were dragged down to Derby's level because the east midlands club surely cannot sink too much lower in this disastrous campaign. Jewell commented in his pre-match press conference on Thursday on the basic need of eliminating the simple errors the team continue to make. Yet despite captain Matt Oakley insisting Jewell had instilled an air of positivity since his arrival, his words are falling on deaf ears. Tuncay's goal was a case in point as a ball was aimlessly hoofed clear out of defence, only for it to be pumped straight back into the path of Downing. To be fair to Jewell and Derby, despite their inability to often play a ball in a straight line to a team-mate, they did create a number of chances, even if many were long range. Teenage star Giles Barnes, Oakley and substitute Jay McEveley - who had replaced the injured Andy Griffin in the 29th minute - all tried their luck from distance. Mark Schwarzer, returning in goal after missing the last two games with a broken thumb, was smartly down on each occasion to smother the respective shots on his goal-line. Derby's best effort in the opening 45 minutes came within a minute of Tuncay's sweet strike, with Kenny Miller clipping the outside of the right-hand post with a shot on the turn from the edge of the area. The only other moment of quality had earlier arrived in the fourth minute, courtesy of the fact Griffin was nowhere to be seen. Taking advantage of the open space at left-back, Tuncay played an inch-perfect ball into the feet of Gary O'Neil, resulting in a searing angled drive that was superbly saved by Bywater. The Rams goalkeeper then kept his side in the game eight minutes into the second half as Boro should have killed the game off. But Bywater produced a stunning fingertip stop to turn a first-time drive from Downing inches past the left-hand post following an electrifying break to Tuncay to tee up the England winger. Moments later, and with Derby's defence rocking, Boro captain George Boateng then planted a header against the left-hand post after diving onto a cross inside the area from Fabio Rochemback. It prompted Jewell into a positive change as he brought on last week's goalscorer in the 4-1 defeat at Manchester United in striker Steve Howard for Gary Teale in the 56th minute. With the Rams playing 4-4-2, and with Barnes switched to his more natural right-wing position, it offered Derby greater stability. It was Barnes who had Derby's best two chances in a closing 30 minutes they primarily dominated as Boro were forced to defend in numbers. But one 20-yard effort was dragged wide, while another from just inside the area was coolly plucked out of the air by Schwarzer. In the end, with relegation rivals Wigan, Sunderland and Birmingham all picking up points, this was a bad day for Jewell and Derby. Middlesbrough boss Gareth Southgate hailed the performance of in-form Tuncay that piled the agony on rock-bottom Derby. Groundbreaking for new Galatasaray Stadium!. Galatasaray soccer team of Turkey laid the foundation of a new sports complex in Istanbul's Seyrantepe neighborhood on Thursday. The stadium itself will have a retractable roof, with the complex having parking for 4,500 vehicles. The stadium, being built by the Prime Minister Housing Development Administration of Turkey (TOKI) and the construction firm Erentalu-Alke, is expected to be completed in two years. Ali Sami Yen was the scene of many great victories, but, is aged and crumbling. ESPN: Fenerbahce 3-1 CSKA Moscow: Turkish delight! Fenerbahce earned a place in the last 16 of the Champions League on Wednesday with a 3-1 win over already eliminated CSKA Moscow. They join Group G winners Inter Milan in the draw for the first knockout round next week. The Turkish were dominant from the outset but went behind to an own-goal by Edu after a mix-up with goalkeeper Volkan Demirel. Alex took only two minutes to equalise, however, with a fine left-foot shot from 25 metres. Ugur Boral then scored in the 45th and 90th minutes. The win demoted PSV Eindhoven, who lost 1-0 to Inter, to UEFA cup football. Fenerbahce advanced to the last 16 for the first time with a 3-1 defeat of CSKA Moscow on Wednesday. Fenerbahce downed CSKA Moscow 3-1 with a double from Ugur Boral to go through from Group G. Group leaders Inter Milan were 1-0 winners at PSV Eindhoven, who had needed a win plus a Fenerbahce defeat to qualify. Fenerbahce found themselves behind against CSKA Moscow after Edu Dracenu put the ball into his own net on the half hour. Just two minutes later, Brazilian Alex levelled for the Turkish side with a 25-metre drop-shot, Ugur Boral hit a second in first-half injury time and notched his second and his side's third with a header in the last minute. Eindhoven's hopes were meanwhile dashed when Edison Mendez was sent off for a professional foul in the first half against Inter Milan. The Dutch, playing for an hour with 10 men, could do nothing to stop David Suazo setting up Julio Cruz to net from close range in the 64th. The results leave Inter Milan top of Group G on 15 points, with Fenerbahce on 11, PSV on seven and CSKA on one. The draw for the Round of 16 will be made in Nyon, Switzerland on Friday December 21. Here are the top sixteen teams in the Tournament: Liverpool, Real Madrid, Porto, Schalke 04 and Olympiakos,AC Milan, Celtic, Barcelona, Manchester United, AS Roma, Inter Milan, Sevilla and Arsenal and Fenerbahce . BESIKTAS AND ERTUGRUL SAGLAM WERE NOT FOCUSED!.. Before the do or die match against FC Porto , the Rookie Coach Ertugrul Saglam said to us that his boys and him self were focused for winning the match in Porto?. Well, he did not write a new page in the club's history...He became the worst Turkish coach to take Besiktas to that 8-0 disaster against Liverpool!. First goal was a huge mistake by Rustu Recber than second goal was a huge mistake by Baki Mercimek!... What really made me mad is the man who said he was focused to win this match did not do anything from the side line after the second goal. He just stood there...I made up my mine, Saglam is not ready to coach in big leagues!. You use 7 corner kicks against FC Porto and can't score?... come on give me brake! It was a disaster second half for Besiktas last night...After the match Saglam said :"Porto Deserved To Beat Us" ..are you out of your mine... You were the week side..you did not do your job along with your players...and you have a guts to say" We have taken a lot of important lessons for the future. We're sad, but we've played some good football and haven't disappointed in Europe." Lucho Gonzalez and Ricardo Quaresma got on the scoresheet as Porto booked their place in the knockout stages of the Champions League with a convincing win over Besiktas on Tuesday. Gonzalez got the ball rolling with a simple finish after some poor decision-making by goalkeeper Rustu Recber left the Besiktas goal wide open, and Quaresma made the points safe in the 62nd minute. In between, Besiktas created some promising attacks, but ultimately they never looked like clawing themselves off the bottom of Group A.
Porto, meanwhile, go into the next round as group winners having collected three wins from their six games. Despite the significance of the tie, the opening was tame. Quaresma delivered the first of several unthreatening shots in the second minute when he chipped into Recber's arms, before using a 25-yard freekick to force a punched save a minute later. Tarik Sektioui then drilled straight at the keeper with an ambitious drive from 30 yards, but the effort, like those from Besiktas duo Matias Delgado and Ibrahim Toraman in the next five minutes, barely warranted attention. Irrespective of their profligacy, it was clear Porto, and in particular their midfield, were dominating the clash. Their main problem, however, came from Recber. The keeper looked to be in formidable form when he got down low to his left to tip Jose Bosingwa's near post drive around the post, and he was equally impressive in putting Lucho Gonzalez's effort wide for a corner. Thereafter, the away side self-destructed. From the resulting 44th minute set-piece, the ball bounced loosely to the edge of the area where Jose Raul Meireles mishit a shot tamely into the air. It should have been an easy and uncontested catch for Recber, but instead the keeper stood motionless protesting - incorrectly - for an offside decision that did not come. 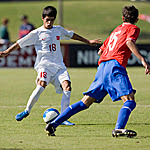 The ball was allowed to drop to Tarik Sektioui, who teed up Gonzalez to volley into the open net. It was a gift of an opener, but prompted a spirited Besiktas response after the break. First, Serdar Ozcan forced Helton to tip his low 46th minute effort around the post from close range and then Edouard Cisse volleyed Rodrigo Tello's inswinging corner wide a minute later. Porto's Silva Paulo Assuncao and Besiktas' Burak Yilmaz then took turns to mishit shots as the second period wore on, but at no point did the Portuguese side look like conceding. In fact, before they finally did make it 2-0, they forced another superb save from Recber. Sektioui created the opening with a skilful run, and Quaresma came agonisingly close with a header which Recber more than matched with a fantastic reflex save. It was a moment of retribution for the keeper, but he could so nothing to stop his side conceding in the 62nd minute. Lisandro Lopez was the architect, bursting through the middle before passing to Quaresma, who held off a challenge and rolled a low shot into Recber's bottom left corner from the edge of the area. Half-chances came and went as the game neared its conclusion, but the efforts, like most in this game, were weak. FC Porto Helton, Bosingwa, Pedro Emanuel, Bruno Alves, Fucile (Cech 75), Lucho Gonzalez (Bolatti 80), Paulo Assuncao, Raul Meireles, Sektioui (Postiga 73), Lopez, Quaresma. Subs Not Used: Nuno, Joao Paulo, Mariano Gonzalez, Adriano. Goals: Lucho Gonzalez 44, Quaresma 62. Besiktas Rustu, Tandogan, Toraman, Mercimek, Uzulmez, Ozcan, Yilmaz (Akin 46), Cisse, Delgado, Tello (Higuain 83), Bobo. Subs Not Used: Arikan, Kas, Kurtulus, Sedef, Avci. 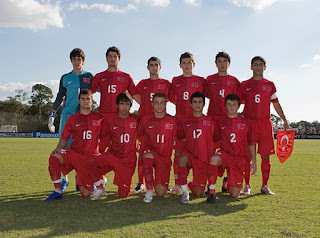 After they lost their two matches , they figured they gave up on these youngsters playing in Florida.. Let's face it in their first match they lost to Brazil 7-2 and than lost to Russia 4-3 ....in their last game on Sunday,Young Turks beat US reserved team 2-0...a win is a win.....and this match was broadcast in North America by Fox soccer channel on tape , in prime time at 8:00 pm,ET. Bradenton, Fla. -- Nothing lasts forever and that includes winning streaks. 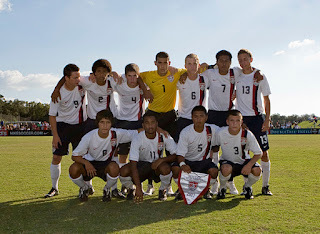 After his team recorded a pair of 2-0 wins in his first two games as U.S. Under-17 national coach, Wilmer Cabrera watched his side go down to Turkey by the same exact score at IMG Academy Sunday. Cabrera, who coached at B.W. Gottschee (Cosmopolitan Junior Soccer League) and was a staff coach with Eastern New York Youth Soccer Association ODP, has a 2-1 record after three games. 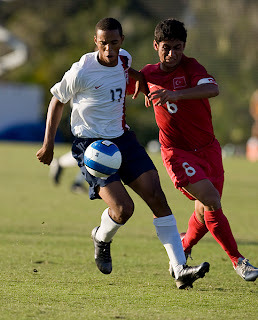 The Americans defeated Russia Thursday and Brazil Saturday. Two first-half goals from Ali Cukadar was the difference for the young Turks. Turkey put the U.S. under pressure right from the start. Cukadar eluded his defender and got on the end of an Omer Karanci cross, snapping his header to the far post and beating goalkeeper Samir Badr in the 11th minute. Two minutes before halftime, Kamil Tevfik played a long ball upfield for Berkin Aslan, who took a perfect first touch with the outside of his foot toward goal. Aslan saw Cukadar alongside him in the box and played a square ball into his path, and Cukadar put it in the net from two yards out. BRADENTON --The bench was an unfamiliar place for Carlos Martinez. 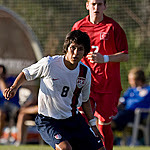 He never occupies it with his club team in Las Vegas, and in the past month as a member of the U.S. Under-17 national soccer team, Martinez never rode the pine. 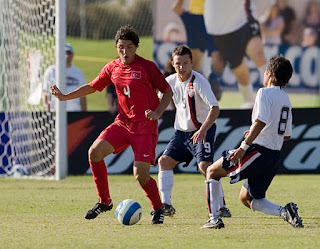 He played prominent roles in the Americans' wins over Russia and Brazil in the 2007 Developmental Academy Nike Friendlies this weekend on the campus of IMG Academies. But for Martinez, Sunday was different in more than one way. 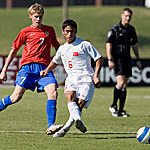 When the U.S. faced Turkey in the final game of the four-day tournament, Martinez, a forward, was on the bench, along with eight other first-teamers. From there they saw the Americans give up a goal for the first time in international play, losing 2-0 to Turkey in front of an overflow crowd in the third international match of the youngsters' careers. "They punished us, because they finished their chances, and we didn't," said Martinez, 15. "I didn't come in until the second half. It's kind of hard to pick up the tempo of the game and finish our chances. It was pretty hard." Coming off consecutive 2-0 victories over Russia and Brazil, arguably the world's top soccer power, the U-17s found themselves in a hole early. In the 11th minute, a shot by Turkey's Ali Cukadar floated past U.S. reserve goalie Samir Badr, giving the Middle Eastern country a one-goal lead. 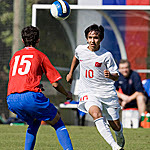 The Americans had trouble pushing the ball and registered five shots on goal to Turkey's nine. In the 43rd minute, Cukadar scored again, and Turkey coasted the rest of the way. 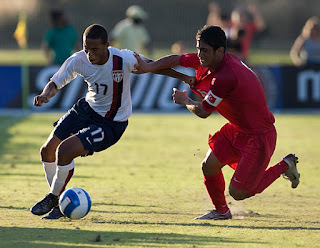 U-17 coach Wilmer Cabrera refuted thoughts of a team letdown or fatigue. The Americans played three tough matches in four days and captured two huge wins over stiff competition. Cabrera said he wanted to test his reserve players. "We want to play tough in a game against family," Cabrera said. "We need to know everybody on the field. We've been practicing with them, but the first two games, we've played with stronger players, but you don't know how good the other ones are if you don't play them. "We needed to know that, and we need to correct some things." Martinez scored a goal in both of the Americans' wins, but for a large portion of Sunday's match, all he could do was watch. Watch the U.S. get pushed around by Turkey. Watch the American reserves struggle in a starting role, and watch their opponents snap celebratory pictures after the match. Martinez's view from the bench was disappointing. He prefers not to leave the field. Porto welcome Besiktas on Tuesday night knowing that a point will be enough to see them through to the knockout stage of the Champions League. Just two points separate the Portuguese side, who top Group A, and Besiktas at the foot of the table, with one round of matches remaining. The Turkish side must win to progress, and coach Ertugrul Saglam knows that his troops will carry the expectations of a nation on their shoulders when they turn out at the Estadio do Dragao. For both clubs the permutations are relatively straightforward despite the fact that any of the four teams in Group A could still qualify. If Porto lose, they cannot qualify for the knockout phase, while Besiktas will not qualify should they fail to win. However, Porto could still qualify for the UEFA Cup if they lose and the other Group A game between Marseille and Liverpool produces a winner. A draw in France combined with a defeat for Porto would send the Dragons out of Europe, while Besiktas cannot finish third due to inferior head-to-head records with Liverpool and Marseille and therefore must take all three points to continue their European campaign. ``We cannot think about enjoying this victory. We want to beat Porto in Portugal and advance to the next round,'' said Saglam after watching his side win 1-0 at Bursaspor at the weekend. ``My players can do it,'' he added. Gokhan Zan, Lamine Diatta (both foot), Serdar Kurtulus (hamstring), Mehmet Yozgatly (hip), Ibrahim Kap (calf) and Ricardinho (broken wrist) all missed the Bursaspor victory through injury and are unlikely to be fit for Tuesday's game. Porto, who opened up a seven-point gap at the top of the Portuguese league with a 1-0 win against Benfica last week, will fancy their chances as they have not been beaten at home in the Champions League since a 3-2 defeat to Artmedia over two years ago. A win will ensure Porto progress as group winners, while a point will be enough to see them top the standings if Marseille and Liverpool draw. Defender Milan Stepanov and midfielder Ernesto Farias are both injured for Porto. Ferreira was able to rest most of his first team for the recent 2-0 win over third division side Chaves in the Portuguese Cup. Fringe players Helder Postiga and Adriano scored the goals but neither striker is likely to feature in the starting XI against the Istanbul-based side. Tuncay and Boro Team end Arsenal's unbeaten run! Middlesbrough inflicted Premier League Arsenal's first league defeat of the season with a 2-1 win at the Riverside on Sunday. Defeat left Arsenal just a point ahead of second-placed Manchester United. Stewart Downing, with a fourth-minute penalty, and Tuncay Sanli, with a close-range strike 16 minutes from time, scored for Boro. Tomas Rosicky pulled a goal back for Arsenal in the fifth minute of stoppage time but there was barely time left for the ensuing kick-off before the final whistle blew. The result meant Boro, who started Sunday in the relegation zone, had won only their third league game of the season. What I thought, and wrote before the match, it happened..well, we have to wait until Sunday to see if Sivaspor could claim the top spot again from Galatasaray. Galatasaray not only lost to Fenerbahace, they might lose the top spot if Sivaspsor wins at home tomorrow against Denizlispor. Galatasaray team was unbeatable for 14 weeks in the Turkcell Super League...That was a a huge run by Gala and German Coach Mr Feldkamp. No one in the Turkish media gives him credit for that. Forget about the credit, the Guy(Erman Toroglu), who has a stick in his hand every week at the "Maraton" program on LiGTV, has a balls to ask him a question in a nasty and absurd way, why he does not play the veteran players on the bench!.... Any way, I don't want to take away any thing from Fenerbahce's gusty win over Galatasaray. Galatasaray had no midfield and early goal scored by Fenerbahce didn't help things , in my opinion. I don't know about you guys but I noticed, one thing after the match, both team coaches talked to the LIGTV reporters both of them looked calm and cool.... Our Turkish coaches , I hope learned from them last night.....No one complain about the referee or critiqued the own players...that's the way it should be..
Lastly, we have to teach a TV journalism to those guys who keeps people in front of the TV screens for hours!....Like that guy, with a stick in his hand , making bold and absurd comments..
Also on Saturday,Kayserispor lost ground on the top four after being held to a goalless stalemate at Caykur Rizespor, while Kasimpasa picked up a rare point with a 2-2 draw against Ankaragucu. 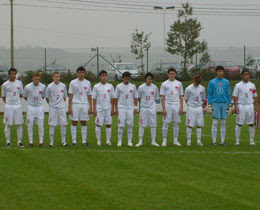 Turkish National soccer team U-16's lost to the Russian National team 3-2.. They will play against US national team on Sunday at 3pm,ET.The match will be broadcast on fox soccer TV on tape at 8:00 pm,ET. One little note to our friend at www.tff.org Turkish Federation web site, the matches is in Florida not in New York....please get that....It is absurd...as a Federation web site you don't know where are the matches playing!....How bad is that! 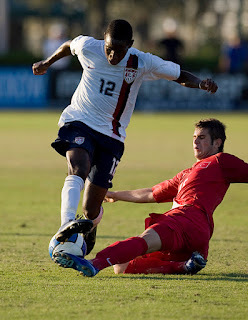 The U.S. kicks off the weekend live on FSC when they go up against Russia on Thursday, Dec. 6 at 3 p.m. ET. Two days later, the U.S. will continue its familiar December match-up with Brazil for the third straight year, and fourth overall, at the Friendlies when the countries square off on Saturday, Dec. 8 at 2:30 p.m. ET. The U.S. will then face Turkey on Sunday at 3 p.m. ET, which will be televised on a same-day delay at 8 p.m. ET. Turkish National team player andb Bayern Munich's Hamit Altintop will be out of soccer(football) for the next month after having a knee operation. .The 24-year-old midfielder,had surgery in Augsburg on Tuesday to repair a damaged meniscus in his right knee. The Bundesliga leaders will be without the utility man for league matches against Duisburg this weekend and Hertha Berlin on December 15, plus the UEFA Cup clash with Greek side Aris Salonika on December 19. He is expected to be able to report for training in January after the Bundesliga starts the month-long winter break on December 15. UEFA DENIES INVESTEGATING LIVERPOOL THRASHING BESIKTAS! After this shocking news published by Sueddeutsche Zeitung,Germain newspaper, UEFA has denied it is investigating Liverpool's 8-0 victory over Besiktas in the Champions League for alleged suspicious betting patterns during the match. ANOTHER LAST MINUTE GOAL SAVES GALATASARAY!.. Although they did not win the match but a come back from behind draw against Istanbul Buyuksehir Belediyespor was good enough for Cimbom to hold the top spot this week too after Sivasspor lost to a relegation team Ankaraspor in Ankara. Ten-man Galatasaray have fought back from a two-goal half-time deficit to secure a 2-2 draw against Istanbul Buyuksehir BSK and narrowly avoid their first defeat of the season in Turkey. After the match Hasan Sas told Turkish media that he does not want to play soccer in Turkey and Galatasaray any more"
Marcus Vinicius Cesario recorded a first-half brace with goals in the 10Th and 40Th minutes before Hakan Kadir Balta pulled one back for the league leaders after 72 minutes. It seemed as though Istanbul were on the verge of recording their first away win of the season when Hasan Sas was sent off in the 80Th minute. But Umit Karan - who had only been on the pitch for 12 minutes - pounced right at the death to steal a point for the Turkish giants. Second-placed Sivasspor lost ground on the leaders after a shock 2-0 defeat at Ankaraspor. Necati Ates opened the scoring for the hosts on 26 minutes before Sidney Tita sealed a vital victory 10 minutes from time to see Ankaraspor put four points between themselves and rock-bottom Kasimpasa. Caykur Rizespor pulled themselves out of the relegation zone with a credible 1-1 draw at high-flying Besiktas. Leandro Rodriguez gave the visitors a surprise lead five minutes into the second half before Matias Delgado equalised for the fourth-placed side in the 72nd minute. But the visitors clung on to take only their second away point of the season. Manisaspor inched their way closer to safety thanks to a 1-0 win over fellow strugglers Gaziantepspor. Filip Holosko scored the only goal of the game from the spot six minutes from time to see the hosts leapfrog their opponents into 13Th spot. Elsewhere Kayserispor maintained their unbeaten home record as they held Genclerbirligi OFTAS to a 1-1 draw. Mehmet Topuz gave Kayserispor the lead in the 17th minute but Ibrahim Sahin drew the visitors level on 29 minutes. LOOK FATIH TERIM !... IT IS SWITZERLAND AGAIN. Draw for the Euro 2008 finals conducted on Sunday in Lucerne city of Switzerland. Besides Switzerland, Portugal and Czech Republic are the rivals of Turkey in Group A. The reason why I bring up the trouble match is, there is a lot of lessons to be learned from that match for both sides!..I hope Fatih Terim will learn from his mistakes from ugly 2005 game in Istanbul. Another thing that bothers me from this ugly match if you all remember, Emre, after this ugly game, said, "He did not do any thing wrong" in that match...every one knows the result!....he was punished for 6 mathes later reduced to 4 mathces, for being Absurd. After the draw look what Mr. Terim saif to world media " "Switzerland has long been our friend.What happened on the pitch remains on the pitch. The last person I embraced before coming here was Swiss team captain Alex Frei"
But, wait, listen to the Swiss captain Alex Frei at the draw, after he had a chat with Terim "Obviously it will be hard for the players who were directly involved like Stephane Grichting and Benjamin Huggel to forgive and forget what happened in Istanbul,"
There won't be revange on the field! Turkish National Soccer team will take on Portugal on June 7th in its first match in Geneva. The second match will be played with Switzerland in Basel on June 11th and the last match with Czech Republic in Geneva on June 15th. Do you like it?.....I don't like it!..it is disgrace....Sound of at the bottom please...let them know what do you think? TUNCAY SANLI SCORES HIS FIRST GOAL IN ENGLAND!.. On the other hand ,he is 38 years old but still strong!...I am talking about Tugay Kerimoglu.... he scored the seal goal for the Blackburns as they defeat Emre's team Newcastle 3-1....by the way "Fatih Terim's captain" Emre, did not play!....I wonder if he would call back Turgay back to the national team?!.... After all he has called up players has not played or start in their own teams....why not call back Tugay Kerimoglu?.... for one or two matches..